Monocytes and tissue macrophages provide both immediate defense against foreign agents and assist during the setting off and development of the adaptive immune response. Monocytes originally derive from CD34+ myeloid progenitor cells in the bone marrow, circulate in the bloodstream, and enter peripheral tissues where they mature into different types of resident macrophages, characterized by low oxygen consumption, low protein synthesis rate, and modest cytokine production (1, 2). Inflammation due to tissue damage or infection results in resident macrophage activation, which increases the production of cytokines, chemokines, and other inflammatory mediators, as well as monocyte recruitment. In the context of specific immune response, the cytokine milieu compels mononuclear phagocytes to express specialized and polarized functional properties. Mirroring the Th1/Th2 nomenclature, many refer to polarized macrophages as M1 and M2 cells (3, 4, 5, 6). Classically polarized activated M1 macrophages have long been known to be induced by IFN-γ alone or in concert with microbial stimuli as LPS, or cytokines as TNF and GM-CSF. M1 cells have an IL-12high, IL-23high, IL-10low phenotype, are proficient producers of effector molecules (reactive oxygen and nitrogen intermediates) and inflammatory cytokines (IL-1β, TNF, IL-6), contribute as inducer and effector cells in polarized Th1 responses, and mediate resistance against intracellular parasites and tumors (7, 8, 9, 10, 11). In contrast, the alternative M2 form of macrophage activation is a generic name used for various forms of nonclassically activated macrophages resulting from cell exposure to IL-4 or IL-13, immune complexes, IL-10, glucocorticoid, or secosteroid (vitamin D3) hormones (3, 9, 12). The various forms of M2 macrophages share an IL-12low and IL-23low phenotype, generally display high levels of scavenger, mannose (13), and galactose-type receptors (3), and arginine metabolism is shifted to production of ornithine and polyamines via arginase (14). Previous studies have addressed the issue of profiling gene expression in M1 or M2 macrophage activation in the mouse, leading to the identification of new molecules expressed in polarized murine macrophages (e.g., Ym1, Fizz1, MRC1) (13, 15, 16). Data on human mononuclear phagocytes on the contrary are scanty and have highlighted important interspecies differences in key molecules, such as arginase and inducible NO synthase, rendering difficult extrapolation (17, 18). In this study, we report for the first time a whole genome transcriptional profile analysis of the human monocyte-to-macrophage differentiation and polarized activation processes, describing distinct molecular signatures which shed new light on these processes and reveal new candidate markers. Recombinant human cytokines were obtained from PeproTech. LPS from Escherichia coli (serotype 055:B5) was obtained from Sigma-Aldrich. Abs were purchased from Serotec, unless specified. Human cytokines were measured using commercial ELISA kits purchased from R&D Systems, according to the manufacturer’s instructions. All chemicals were obtained from Sigma-Aldrich, unless specified. Human monocytes were obtained from normal blood donor buffy coats by two-step gradient centrifugation followed by an additional step using the Monocyte Isolation kit II (Miltenyi Biotec) as previously described (17). Macrophages were obtained by culturing monocytes (98% CD14+, 13% CD16+) for 7 days in RPMI 1640 (Biochrom) supplemented with 20% FCS (HyClone) and 100 ng/ml M-CSF in FCS-coated dishes at a density of 1.5 × 105/cm2. Macrophage polarization was obtained by removing the culture medium and culturing cells for an additional 18 h in RPMI 1640 supplemented with 5% FCS and 100 ng/ml LPS plus 20 ng/ml IFN-γ (for M1 polarization) or 20 ng/ml IL-4 (for M2 polarization). Five different cell types were generated: freshly isolated monocytes (Mo), cells at intermediate differentiation (3 days of culture: Md3), resting fully differentiated macrophages (7 days of culture: Mφ), classical activated macrophages (M1), alternative activated macrophages (M2). The transcriptional profile was evaluated in three independent cell preparations, each derived from a different single donor using the Human Genome U133 A and B arrays (HG-U133; Affymetrix) containing a total of ∼39,000 transcripts. RNA purification and labeling, hybridization, and array scanning were conducted as previously described (19). Scanned images and raw data were processed using robust multiarray average (20, 21). Principal component analysis (PCA)3 was conducted on all genes analyzed to assign the general variability in the data to a reduced set of variables called principal components (22). Gene expression differences were assessed by means of Student’s t test, with false discovery rate correction for multiple testing (23) (R Bioconductor). Genes with an false discovery rate ≤0.05 and a fold change ≥2 were considered differentially expressed. After removal of redundant genes, an expression matrix (3530 × 15) was obtained, and figures-of-merit analysis was applied to define the optimal number of clusters (24). Each cluster was then analyzed by K-means and hierarchical clustering algorithms with squared Pearson correlation as similarity measurement (25). To identify overrepresented biological categories within each cluster, the Expression Analysis Systematic Explorer analysis based on the Gene Ontology (GO) database was applied (26), the percentage of genes within each category per total amount of genes in each cluster was calculated, and hierarchical clustering was conducted grouping clusters according to their similarities in gene function representation. In each cluster, the 50 most down-regulated and the 50 most up-regulated genes were selected for interactome analysis using the ResNet-3.0 literature database (27). The entire data set and technical information requested by Minimum Information about a Microarray Experiment (MIAME) compliant are available at the Gene Expression Omnibus (GEO) website (〈www.ncbi.nlm.nih.gov/geo〉), accession number GSE5099. Real-time PCR was performed using gene-specific primers designed using AutoPrime (〈www.autoprime.de〉). Primer and probe sequences are available in the public RTPrimerDB database (〈http://medgen.UGent.be/rtprimerdb/〉) (gene (RTPrimerDB-ID): GPR105 (3478), GPR87 (3479), P2RY13 (3480), P2RY12 (3481), GPR171 (3482)) (28). Five replicates per each experimental point were performed, and differences were assessed with a two-tailed Student’s t test. Results were normalized using the housekeeping gene GAPDH and the ΔΔ cycle threshold method (19) and are expressed as relative fold of stimulated over control group, used as calibrator. After removing the medium, cells were washed in PBS and lysed in ice-cold lysis buffer (2% Triton X-100, 10 mM Tris-HCl (pH 8), 150 mM NaCl, 2 mM NaN3, 2 mM EDTA) containing protease inhibitors (Roche Molecular Biochemicals) for 45 min at 4°C. Lysates were harvested and centrifuged at 13,400 × g to eliminate nuclei. Protein concentration was determined using the bicinchoninic acid assay (Pierce) and 30 μg of protein was electrophoresed in a 7.5% SDS-PAGE under nonreducing conditions and transferred to nitrocellulose using standard procedures. PTGS1 and PTGS2 were detected using the specific mAbs CXIII and CX229 (Alexis). The transcriptional events associated with M-CSF-dependent monocyte-to-macrophage differentiation and subsequent M1 or M2 cell polarization induced by LPS plus IFN-γ or IL-4, respectively, were investigated using oligonucleotide microarrays. Results demonstrated the existence of a complex network of gene regulation and clearly identified specific gene expression patterns that characterize each phase. PCA analysis was applied to the complete dataset and demonstrated that 98% of the total variance of the system lies within the first two components. PCA revealed that monocyte maturation was associated with a significant modification of the global transcriptome (∼35% of the total variance), with larger changes taking place in the early phase of the process (∼24% variance in the first 3 days of differentiation), followed by a smaller overhaul (∼11% variance in the last 4 days of differentiation) in the late phase (Fig. 1⇓). Macrophage polarization was also associated with significant changes at the transcriptional level, although the two polarizing conditions were very different, with M1 polarization profoundly affecting the transcriptional profile (∼90% variance in the shift from Mφ to M1), and M2 polarization resulting in only subtle adjustments (∼8% variance in the shift from Mφ to M2) (Fig. 1⇓). , monocytes after 3 days of culture with M-CSF (Md3); ○, macrophages after 7 days of culture with M-CSF (Mφ); ▴, M1-polarized macrophages (M1); ▵, M2-polarized macrophages (M2). Differentially expressed genes, selected as described in Materials and Methods, were subjected to figures-of-merit analysis, where K-means clustering performed optimally for 12 clusters, with no increase in the predictive value of the algorithm for additional behavioral categories (data not shown). Squared Pearson correlation was used as similarity measurement, cumulating clusters with mirror performances and generating a total of 6 gene clusters (Fig. 2⇓). To gain insight into the biological processes involved, each cluster was then subjected to hierarchical subclustering (supplemental figures 1–6)4 and GO analysis as included in the Expression Analysis Systematic Explorer (26) (Fig. 3⇓). K-mean clustering of genes differentially expressed during macrophage differentiation and polarization. Modulated genes were organized by K-means clustering. The x-axis corresponds to the experimental conditions, the y-axis to expression levels. Each line represents a gene, with red and green for high and low expression levels, respectively. 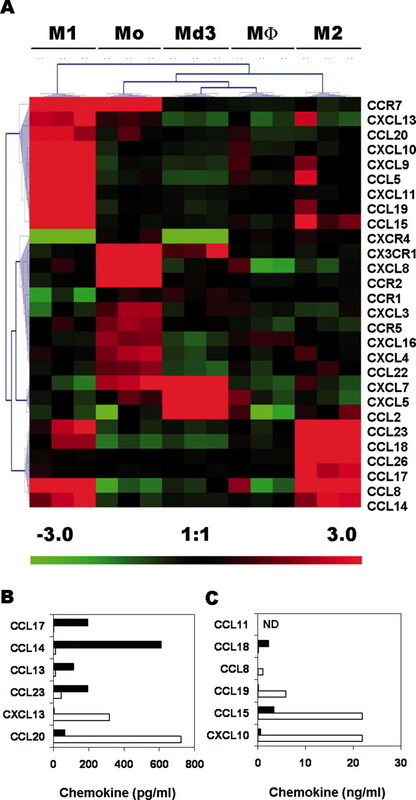 Monocyte differentiation correlated with a cluster on early affected genes (A, 478 genes) and a cluster of late affected genes (B, 390 genes). Two clusters (D, 1108 genes; E, 945 genes) are associated with M1 polarization, and one cluster (F, 104 genes) with M2 polarization. C (505 genes) includes genes with a complex behavior not directly linked to a specific cell differentiation state. GO analysis of human macrophage differentiation and polarization. Hierarchical clustering of the percentage of genes associated with a GO category with respect to the total number of genes in the cluster. Columns represent clusters of Fig. 2⇑ (the full graph is present in supplemental figure 7SM). Monocyte-to-macrophage differentiation was associated with modulation of 868 (2.2%) transcripts in total (Fig. 2⇑, A and B). Of these, 390 (1.0%) genes were transiently regulated during the first stage of the differentiation process and returned to basal levels in fully differentiated macrophages (Fig. 2⇑A; list of genes in supplemental figure 1SM). In this cluster, GO analysis highlighted an overrepresentation of molecules associated with cell cycle (Fig. 3⇑), including positive modulators of cell proliferation such as cyclins (A2, that regulates S phase progression; B1 and B2, that regulate G2-M phase transition; D1 and D3, which regulate G1 phase progression; E2, participating in the late G1-S phase transition) and cell division-associated proteins 1, 2, 5, 6, 7, and 20 (29, 30, 31) (supplemental figure 1SM). Interactome analysis of transiently modulated genes highlighted three main nodes around the genes CDC2, BCL2L11, and CCL2, as well as the concerted down-regulation of HLA members. Also notable was the high number of nuclear proteins and the low number of soluble factors among the main regulated genes (Fig. 4⇓A). A second cluster contained 478 (1.2%) genes rapidly regulated during the differentiation process, maintained in mature macrophages, and essentially refractory to polarizing stimuli (Fig. 2⇑B; list of genes in supplemental figure 2SM). These transcripts mostly corresponded to membrane receptors, signal transducers, and extracellular proteins functionally related to the immune response (Fig. 3⇑). Interactome analysis of stably M-CSF-regulated genes showed an inversion in the gene distribution, with a smaller percentage of nuclear genes and an increase of membrane receptors and soluble factors. It also highlighted three main nodes around the down-regulated genes IL-1 and IL-8 and the up-regulated gene apolipoprotein E. A concerted down-regulation of chemokine receptors, cystatins, and defensins, and an opposite increase of complement components was also noticed (Fig. 4⇓B). Interactome analysis of representative genes involved in monocyte-to-macrophage differentiation and polarization. A, Prototypical macrophage was constructed from the best 100 genes representative of each transitional state. A, Composite of genes changed transiently changed in maturation. B, Genes stably changed with the maturation and (C) genes differentially expressed between M1 and M2 cells (C). For A and B, red and green represent increased and decreased genes, respectively. In C, red represents M1 genes while green stands for M2 genes. As indicated by PCA, M1 polarization had a major effect on cell transcriptome, affecting 2053 (5.2%) transcripts in total (Fig. 2⇑, C and D). Of these, 1108 (2.8%) genes were exclusively associated with classical macrophage activation (Fig. 2⇑C; list of genes in supplemental figure 3SM), while a second cluster of 945 (2.4%) transcripts included a majority of genes associated with classical activation and a minor fraction (20 genes, corresponding to ∼2% of the genes) concordantly regulated by IL-4 (Fig. 2⇑D; list of genes in supplemental figure 4SM). GO analysis revealed an overrepresentation of genes related to DNA transcription and protein metabolism, such as ribosomal proteins and eukaryotic translation initiation factors (Fig. 3⇑). Although less dramatic than M1, M2 polarization exerted a significant effect on macrophage transcriptional profile, modulating a total of 104 (∼0.3%) transcripts (Fig. 2⇑E; list of genes in supplemental figure 5SM). GO analysis indicated that this set of genes is particularly rich in immune system-related molecules, including cytokines, chemokines, and G protein-coupled receptors (GPCR) (Fig. 3⇑). A peculiar cluster included 505 (1.3%) genes with high expression in Mo and M1 cells and opposite regulation in Mφ and M2 cells (Fig. 2⇑, cluster F; list of genes in supplemental figure 6SM). Unexpectedly, genes with high expression in Mo and M1 macrophages included prototypic M1 polarization markers, such as the indoleamine-pyrrole 2,3 dioxygenase (32, 33), the lysosomal-associated membrane protein 3, IL-7R (3, 5), and CCR7, though despite transcript expression, monocytes did not express membrane CCR7 (data not shown). Similarly, genes with high expression in Mφ and M2 cells included classic M2 polarization markers, such as the mannose receptor 1 (34, 35), the scavenger receptors SR-A and M160 (3, 5, 36). GO analysis revealed that a relevant percentage of these genes is involved in cellular metabolic activities, such as active transport and oxidoreductase activities (Fig. 3⇑). To identify genes strictly associated with macrophage polarization, genes included in clusters C to F have been ranked according to their fold difference between M1 and M2 profiles and further grouped into functional categories (Table I⇓⇓). The interactome highlights a central role of a restricted panel of molecules, including CXCR4, TRAIL (TNFSF10/TRAIL), insulin-like growth factor I, and fibronectin 1, and clearly shows that macrophage polarization is mainly associated with regulation of membrane receptors and extracellular proteins with a minor contribution of nuclear factors, directly opposite to monocyte differentiation (Fig. 4⇑C). GO analysis was used to identify functional categories overrepresented in the panel of genes associated with monocyte differentiation and macrophage polarization. 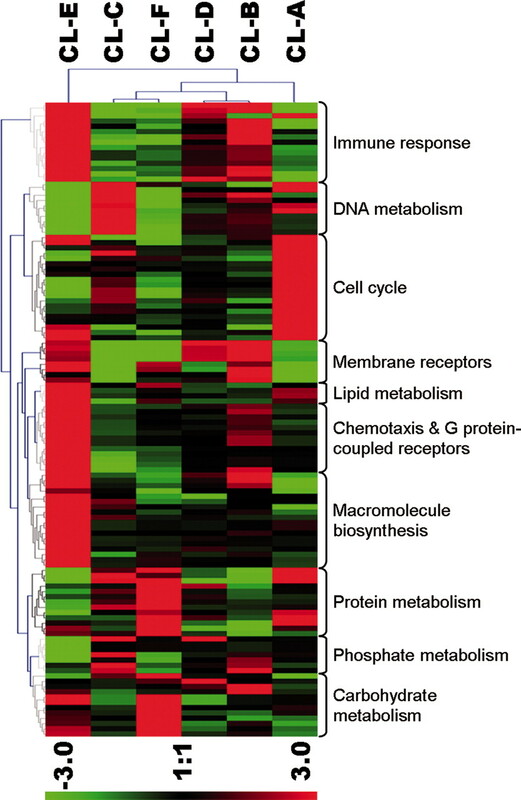 Consistent with the well-recognized capability of macrophages to respond and produce a vast range of lipidic products, one of the most overrepresented categories was lipid metabolism (Fig. 3⇑). In particular, transcriptional analysis revealed a unique regulation profile for different enzymes involved in eicosanoid production (Fig. 5⇓A). Monocyte-to-macrophage maturation was associated with a gradual loss of PG-endoperoxide synthases (both PTGS1 and PTGS2), as well as the arachidonate 5-lipoxygenase (ALOX5), and leukotriene A4 hydrolase. As expected, classical activation was associated with a marked induction of cyclooxygenase (COX)-2 (37), accompanied by a significant unexpected further down-regulation of COX-1, leukotriene A4 hydrolase, thromboxane A synthase 1, and ALOX5. Conversely, alternative activation resulted in the up-regulation of the M2 marker arachidonate 15-lipoxygenase and unexpectedly COX-1, here confirmed at the protein level (Fig. 5⇓B). Differential regulation of arachidonate metabolism-related enzymes in human macrophage differentiation and polarization. 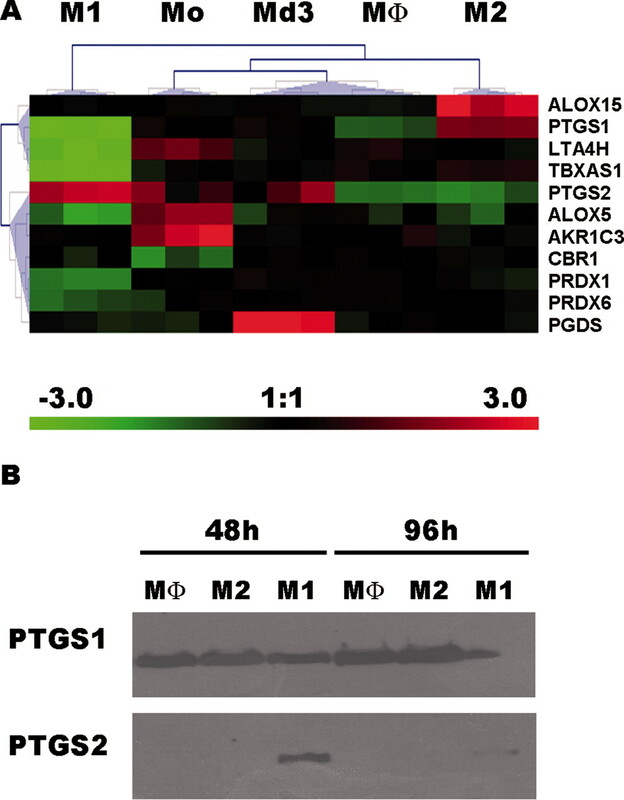 A, Transcriptional analysis reveals a unique regulatory network of the PG synthases (PTGS), with M1 polarization resulting in increased expression of PTGS2 (COX2) and inhibition of PTGS1 (COX1), and M2 inducing a mirror regulation. B, Western blot analysis confirmed selective induction of COX2 in M1 macrophages and COX1 in M2 macrophages. Results from one experiment are shown, representative of three independent experiments. Sphingolipid mediators, such as sphingosine 1-phosphate, ceramide 1-phosphate, and sphingosine are derived by the enzymatic breakdown of sphingomyelin, and display potent effects on multiple organ systems. Within this pathway, the most interesting finding is the opposite regulation of the sphingosine and ceramide kinases, expressed in M1 and M2 macrophages, respectively. A second category highlighted by GO analysis was represented by GPCRs (Fig. 3⇑). From a total of 465 entries of GPCRs represented in the microarray, 53 were detected as differentially expressed during monocyte differentiation and macrophage polarization (Fig. 6⇓A). The hierarchical clustering demonstrates that each stage is characterized by the expression of a specific group of GPCRs. Monocytes are characterized by a cluster of 11 highly expressed genes, 5 of which correspond to chemotactic receptors: CCR2, CCR5, CCR7, CX3CR1, and FPR1. The combination of IFN-γ and LPS has a broad effect with no clear family overrepresentation, while IL-4 activation is characterized by a cluster of 8 genes with high expression, 5 of which are nucleotide receptors: GPR86, GPR105, P2Y8, P2Y11, and P2Y12. Interestingly, GPR86, GPR105, and P2Y12 are positioned together in chromosome 3. Real-time PCR confirmed the up-regulation of this M2-associated gene cluster (P2Y12, GPR105, and GPR86), and revealed minor overexpression for the closest genomic neighbors GPR87 and H963 (Fig. 6⇓B). Repertoire of GPCRs expressed during macrophage differentiation and polarization. A, Hierarchical clustering of differentially expressed GPCRs, obtained using average linkage and Pearson correlation as distance. B, Real-time PCR confirmation of microarray results. ▪ and □ represent M1 and M2 cells, respectively. Statistical analysis was performed with a two-tailed paired t test in five different blood donors. SE was always below 5% of the individual means (data not shown). All genes were significantly different in M2 vs control macrophages (p < 0.05). Macrophage maturation and polarization are characterized by specific patterns of chemokines as suggested by GO ontology analysis (Fig. 7⇓A). In addition to chemokines already known to be differentially expressed in polarized macrophages (e.g., CXCL10 for M1; CCL17 for M2), we found new chemokine signatures associated with cell polarization (Fig. 7⇓A). The profiling results were confirmed by real-time PCR (data not shown) and by measurements of released proteins (Fig. 7⇓, B and C). Differential expression of chemokines during macrophage differentiation and polarization. A, Hierarchical clustering of chemokine expression levels. B and C, ELISA measurement of secreted chemokines in the supernatant of M1- and M2-polarized macrophages. ▦ and ▪, M1 and M2 cells, respectively. All values were statistically significant as assessed by two-tailed paired t test (p < 0.05), and represent data from five different blood donors. Bars represent the SEM. The present study was designed to characterize the gene expression profile of human monocytes undergoing differentiation into mature macrophages in the presence of M-CSF and subsequent polarized activation into M1 or M2 cells. These processes were associated with major changes in the global transcriptome. Macrophage polarization to M1 was associated with the most dramatic change in the transcriptome, whereas stimulation with IL-4 of M-CSF-differentiated macrophages caused a relatively minor alteration in gene expression. This apparently minor effect of IL-4 is due to the fact that M-CSF-driven differentiation leads per se to the acquisition of M2 properties, including expression of mannose receptor 1 and scavenger receptors SR-A. This finding is in agreement with previous data showing divergent M1-M2 properties of macrophages differentiated in GM-CSF compared with M-CSF (38, 39). M-CSF is a homeostatic growth factor circulating at high levels in normal blood. Thus, drifting toward M2 may be a default pathway in macrophage differentiation. In particular, monocyte differentiation in the presence of M-CSF was associated with early (day 3) dramatic regulation of cell-cycle genes, including the cyclins A2, B1, B2, D1, D3, E2, and CDCA 1, 2, 5, 6, and 7. Though human mononuclear phagocytes, unlike mouse macrophages, are generally considered terminally differentiated nonproliferating cells, there are reports of human monocyte-macrophage proliferation (40, 41). Evidence for proliferation in the culture was also confirmed in the present study (data not shown). Thus, the proliferative potential of human monocytes should not be underestimated and could be exploited and tailored for cell expansion. Modulation of genes involved in general cellular metabolic activities is a prominent feature of macrophage differentiation and polarization. In addition to providing tools for macrophage function in tissues, these changes may have a more subtle significance. For instance, macrophages are a major component of adipose tissue and play a role in the metabolic syndrome (42). Macrophages are an active source of pro- and anti-inflammatory lipid mediators, such as arachidonic acid derivatives and phosphosphingolipids. COX-2 has long been associated with arachidonic acid metabolism in M1 cells (37). In contrast, the finding that M-CSF-differentiated macrophages retain high levels of COX-1 and that these levels are further augmented by IL-4 is novel and unexpected. 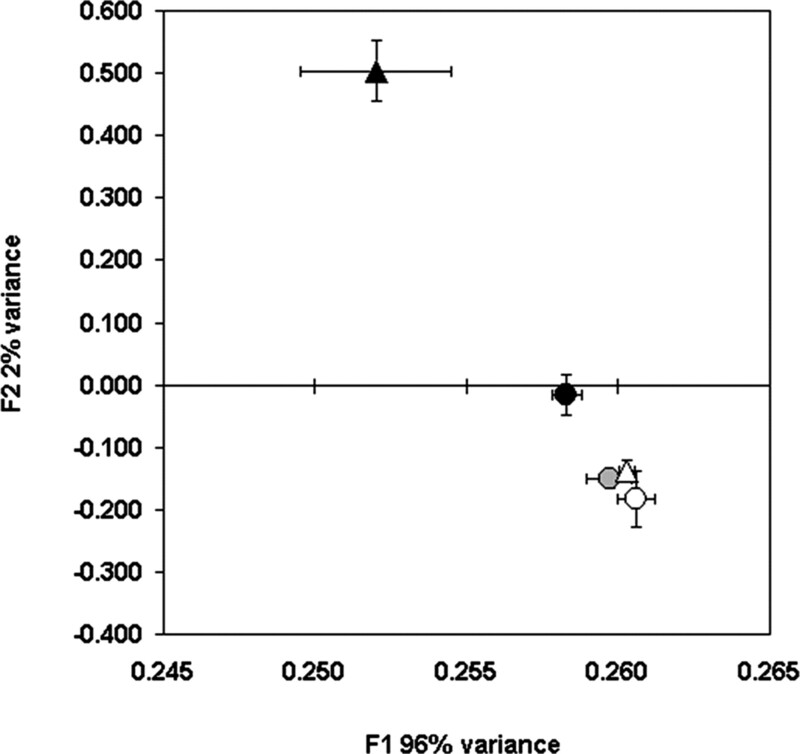 This induction is of functional relevance for eicosanoid production (data not shown) and may contribute to pathophysiological reactions, such as toxicity of aspirin and related drugs in asthma (43, 44). The interconvertible ceramide metabolites sphingosine 1-phosphate and ceramide 1-phosphate have emerged as potent bioactive agents which regulate critical cellular functions including cell proliferation, phagocytosis, differentiation, angiogenesis, chemotaxis, and cell survival (45). Our results suggest that these enzymes can aid in distinguishing between polarized forms of activation, being sphingosine and ceramide kinase selectively present in M1 and M2 macrophages, respectively (Table I⇑⇑). M1 polarization is associated with the up-regulation of ABCA1, the primary gatekeeper for eliminating tissue cholesterol, and a set of apolipoproteins clustered on chromosome 22q12.3 including APOL1, APOL2, APOL3, and APOL6, which play a central role in cholesterol transport and atherosclerosis (46). Different stages of monocyte differentiation and polarization are characterized by different repertoires of GPCR. In agreement with previous reports, CCR2 is rapidly down-regulated during monocyte differentiation (47). CX3CR1 is also down-regulated, but at a slower rate, being still expressed on day 3. LPS and IFN-γ up-regulate CCR7 and down-regulate CCR1 in mature macrophages, as they do in dendritic cells (48, 49). Presumably, this reciprocal regulation underlies the trafficking of macrophages to lymph nodes, where their disposal occurs. Strikingly, of the eight GPCRs highly expressed in the M2 cells, five are nucleotide receptors (Fig. 6⇑), the UDP-glucose receptor GPR105 being among the most highly regulated genes in human macrophages in response to IL-4. M2 macrophages are associated with tissue remodeling. High expression of nucleotide receptors endows M2 cells with sensors for tissue damage (50, 51), and preliminary data suggest that these ligands modulate relevant functions in this cell type (data not shown). The chemokine repertoires of mononuclear phagocytes exposed to polarizing stimuli are profoundly different (4, 5) and the results presented here extend this general view. In addition to well-known polarized chemokines, such as CXCL10 for M1 and CCL17 for M2 cells, we found high levels of CCL8, CCL15, CCL19, CCL20, and CXCL13 in M1 cells, and CCL13, CCL14, CCL17, CCL23, and CCL26 in M2 cells. Association of these molecules with polarized macrophage activation may contribute to pathophysiology. For instance, we found that M2 cells do not produce detectable levels of CCL11 but may contribute to the recruitment of CCR3-positive leukocytes such as eosinophils, basophils, and some polarized Th2 cells (4) through the expression of CCL26. A hallmark of M1 polarization is the synthesis of the proinflammatory cytokines IL-6, IL-12, and IL-15 (5) and receptors for IL-2R α-chain, IL-15R α-chain, and IL-7R as previously described in mice (52, 53). In the other pole, M2 are characterized by the overexpression of several scavenger receptors able to bind a diverse array of endogenous and foreign molecules (54). Our results confirm the up-regulation by IL-4 of the mannose receptor 1 (13), the macrophage scavenger receptor 1(36), the C-type lectin-like receptor Dectin-1 (55) and DC-SIGN (CD209) (56) and report for the first time in mature macrophages the up-regulation of DCIR, also called CLECSF6 (57), thoroughly studied in dendritic cells and the less described C-type lectin DCL-1 (58) and CLECSF13. Alternatively activated macrophages are also characterized by increased expression of fibronectin (59), which is involved in cell adhesion and migration processes during embryogenesis, wound healing, blood coagulation, and metastasis. The solute carrier family of proteins comprises genes whose primary role is the transport of divalent cations and small organic molecules. They regulate transcription through DNA-binding proteins and metal response elements, the activity of enzymes including metalloproteases, superoxide dismutase, inducible NO synthase, and functions like endosomal fusion, and metabolism. Despite the recognized role of some members in immune disease susceptibility and infection (60), they have not been associated with macrophage polarization. We find that classically activated macrophages are characterized by increased expression of the solute carrier family members SLC21A15 and SLC31A2, while alternatively activated macrophages exhibit increased SLC4A7, SLC38A6 expression (Table I⇑⇑). The role of these molecules remains to be elucidated. Hitherto, expression data related to macrophage polarization primarily concern the murine system (3). Investigation of selected markers in the human system have previously highlighted interspecies discrepancy (17, 61). This report represents the first comprehensive description of the human mononuclear phagocyte system, and provides further evidence of relevant interspecies variability. For example, IL-4 in this study, as well as IL-13 in our previous expression-profiling experiments (17), did not induce the human homolog of the mouse alternative activation markers arginase 1, Fizz1, MMP1 and Ym1. Similarly, a number of molecules not involved in macrophage polarization in the murine system emerged from this data set as human macrophage alternative activation markers, including fibrinoligase (F13A1) and platelet-derived growth factor C. In contrast, other mouse alternative activation markers such as the GPCR cluster discussed above were confirmed in our system. Collectively, results indicate that ∼50% of macrophage polarization markers selectively apply to one species and not to the other, cautioning against direct mouse-to-human translation of polarization markers. A direct comparison based on expression profiling results will be required to fully describe interspecies variability. Polarization of mononuclear phagocyte function is a useful simplified conceptual framework, describing a continuum of functional states. 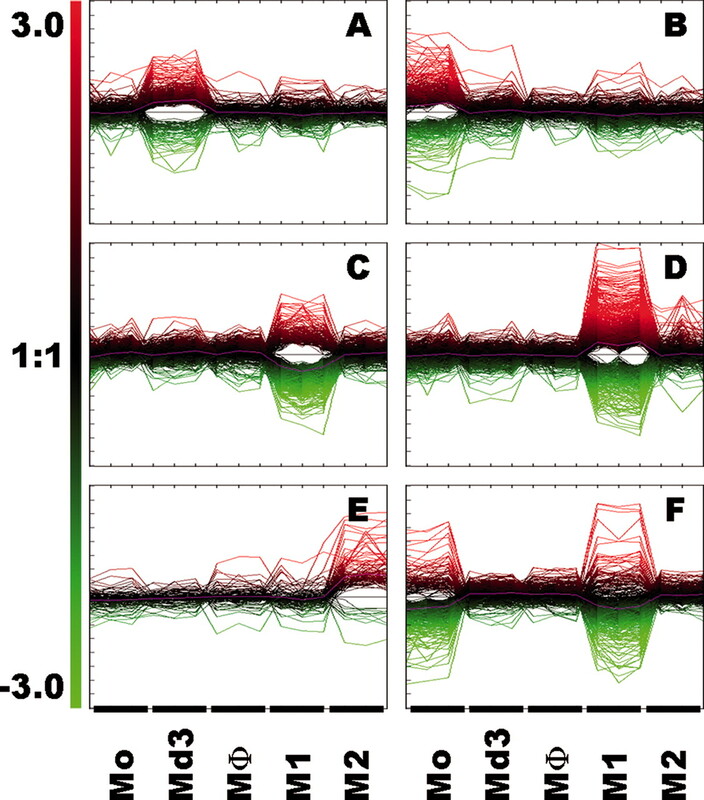 Different forms of M2 polarization have been described in vitro and ex vivo (3, 5, 9). The study reported here using a global profiling approach, describes new molecules and signatures associated with different stages of the human monocyte-to-macrophage differentiation and polarization, which may represent novel tools and targets in pathophysiology. ↵1 This work was supported by the Italian Association for Cancer Research, Ministero dell’Istruzione dell’Università e della Ricerca (Fondo Investimenti Ricerca di Base, Progetto di Rilevante Interesse Nazionale, and Consiglio Nazionale delle Ricerche funding), Fondo Interno per la Ricerca Scientifica e Tecnologica (FIRST Project), Ministero della Salute, Fondazione Cariplo (NOBEL Project), and the European Commission (Innochem Project, FP6-518167; Mugen Project, LSHG-CT-2005-005203). F.O.M. is a recipient of the International PhD program in Cellular and Molecular Biology fellowship from Vita-Salute San Raffaele University. ↵3 Abbreviations used in this paper: PCA, principal component analysis; GO, Gene Ontology; GPCR, G protein-coupled receptor; ALOX5, arachidonate 5-lipoxygenase; COX, cyclooxygenase; Mo, monocyte; Mφ, macrophage. Grage-Griebenow, E., H. D. Flad, M. Ernst. 2001. Heterogeneity of human peripheral blood monocyte subsets. J. Leukocyte Biol. 69: 11-20. Hume, D. A., I. L. Ross, S. R. Himes, R. T. Sasmono, C. A. Wells, T. Ravasi. 2002. The mononuclear phagocyte system revisited. J. Leukocyte Biol. 72: 621-627. Mantovani, A., A. Sica, M. Locati. 2005. Macrophage polarization comes of age. Immunity 23: 344-346. Goerdt, S., C. E. Orfanos. 1999. Other functions, other genes: alternative activation of antigen-presenting cells. Immunity 10: 137-142. Nathan, C. F., H. W. Murray, M. E. Wiebe, B. Y. Rubin. 1983. Identification of interferon-γ as the lymphokine that activates human macrophage oxidative metabolism and antimicrobial activity. J. Exp. Med. 158: 670-689. Mills, C. D., K. Kincaid, J. M. Alt, M. J. Heilman, A. M. Hill. 2000. M-1/M-2 macrophages and the Th1/Th2 paradigm. J. Immunol. 164: 6166-6173. Stein, M., S. Keshav, N. Harris, S. Gordon. 1992. Interleukin 4 potently enhances murine macrophage mannose receptor activity: a marker of alternative immunologic macrophage activation. J. Exp. Med. 176: 287-292. Zhu, Z., T. Zheng, R. J. Homer, Y. K. Kim, N. Y. Chen, L. Cohn, Q. Hamid, J. A. Elias. 2004. Acidic mammalian chitinase in asthmatic Th2 inflammation and IL-13 pathway activation. Science 304: 1678-1682. Scotton, C. J., F. O. Martinez, M. J. Smelt, M. Sironi, M. Locati, A. Mantovani, S. Sozzani. 2005. Transcriptional profiling reveals complex regulation of the monocyte IL-1β system by IL-13. J. Immunol. 174: 834-845. Martinez, F. O., M. Sironi, A. Vecchi, F. Colotta, A. Mantovani, M. Locati. 2004. IL-8 induces a specific transcriptional profile in human neutrophils: synergism with LPS for IL-1 production. Eur. J. Immunol. 34: 2286-2292. Raychaudhuri, S., J. M. Stuart, R. B. Altman. 2000. Principal components analysis to summarize microarray experiments: application to sporulation time series. Pac. Symp. Biocomput. 5: 452-463. Reiner, A., D. Yekutieli, Y. Benjamini. 2003. Identifying differentially expressed genes using false discovery rate controlling procedures. Bioinformatics 19: 368-375. Yeung, K. Y., D. R. Haynor, W. L. Ruzzo. 2001. Validating clustering for gene expression data. Bioinformatics 17: 309-318. Nikitin, A., S. Egorov, N. Daraselia, I. Mazo. 2003. Pathway studio–the analysis and navigation of molecular networks. Bioinformatics 19: 2155-2157. Pattyn, F., F. Speleman, A. De Paepe, J. Vandesompele. 2003. RTPrimerDB: the real-time PCR primer and probe database. Nucleic Acids Res. 31: 122-123. Payton, M., S. Coats. 2002. Cyclin E2, the cycle continues. Int. J. Biochem. Cell Biol. 34: 315-320. Doree, M., T. Hunt. 2002. From Cdc2 to Cdk1: when did the cell cycle kinase join its cyclin partner?. J. Cell Sci. 115: 2461-2464. Vidal, A., A. Koff. 2000. Cell-cycle inhibitors: three families united by a common cause. Gene 247: 1-15. Carlin, J. M., E. C. Borden, G. I. Byrne. 1989. Interferon-induced indoleamine 2,3-dioxygenase activity inhibits Chlamydia psittaci replication in human macrophages. J. Interferon Res. 9: 329-337. Hissong, B. D., G. I. Byrne, M. L. Padilla, J. M. Carlin. 1995. Upregulation of interferon-induced indoleamine 2,3-dioxygenase in human macrophage cultures by lipopolysaccharide, muramyl tripeptide, and interleukin-1. Cell Immunol. 160: 264-269. Martinez-Pomares, L., D. M. Reid, G. D. Brown, P. R. Taylor, R. J. Stillion, S. A. Linehan, S. Zamze, S. Gordon, S. Y. Wong. 2003. Analysis of mannose receptor regulation by IL-4, IL-10, and proteolytic processing using novel monoclonal antibodies. J. Leukocyte Biol. 73: 604-613. Linehan, S. A., P. S. Coulson, R. A. Wilson, A. P. Mountford, F. Brombacher, L. Martinez-Pomares, S. Gordon. 2003. IL-4 receptor signaling is required for mannose receptor expression by macrophages recruited to granulomata but not resident cells in mice infected with Schistosoma mansoni. Lab. Invest. 83: 1223-1231. Cornicelli, J. A., D. Butteiger, D. L. Rateri, K. Welch, A. Daugherty. 2000. Interleukin-4 augments acetylated LDL-induced cholesterol esterification in macrophages. J. Lipid Res. 41: 376-383. Barrios-Rodiles, M., K. Chadee. 1998. Novel regulation of cyclooxygenase-2 expression and prostaglandin E2 production by IFN-γ in human macrophages. J. Immunol. 161: 2441-2448. Cheung, D. L., J. A. Hamilton. 1992. Regulation of human monocyte DNA synthesis by colony-stimulating factors, cytokines, and cyclic adenosine monophosphate. Blood 79: 1972-1981. Bischof, R. J., D. Zafiropoulos, J. A. Hamilton, I. K. Campbell. 2000. Exacerbation of acute inflammatory arthritis by the colony-stimulating factors CSF-1 and granulocyte macrophage (GM)-CSF: evidence of macrophage infiltration and local proliferation. Clin. Exp. Immunol. 119: 361-367. Lehrke, M., M. A. Lazar. 2004. Inflamed about obesity. Nat. Med. 10: 126-127. Pradalier, A., D. Vincent. 2000. Aspirin: allergy or intolerance. Rev. Med. Interne 21: (Suppl. 1):75s-82s. Sanchez-Borges, M., A. Capriles-Hulett, F. Caballero-Fonseca. 2004. Adverse reactions to selective cyclooxygenase-2 inhibitors (coxibs). Am. J. Ther. 11: 494-500. Chalfant, C. E., S. Spiegel. 2005. Sphingosine 1-phosphate and ceramide 1-phosphate: expanding roles in cell signaling. J. Cell Sci. 118: 4605-4612. Duchateau, P. N., C. R. Pullinger, M. H. Cho, C. Eng, J. P. Kane. 2001. Apolipoprotein L gene family: tissue-specific expression, splicing, promoter regions; discovery of a new gene. J. Lipid Res. 42: 620-630. Greenberg, S., F. Di Virgilio, T. H. Steinberg, S. C. Silverstein. 1988. Extracellular nucleotides mediate Ca2+ fluxes in J774 macrophages by two distinct mechanisms. J. Biol. Chem. 263: 10337-10343. Murata, Y., T. Ohteki, S. Koyasu, J. Hamuro. 2002. IFN-γ and pro-inflammatory cytokine production by antigen-presenting cells is dictated by intracellular thiol redox status regulated by oxygen tension. Eur. J. Immunol. 32: 2866-2873. Ohteki, T.. 2002. Critical role for IL-15 in innate immunity. Curr. Mol. Med. 2: 371-380. Peiser, L., S. Gordon. 2001. The function of scavenger receptors expressed by macrophages and their role in the regulation of inflammation. Microbes Infect. 3: 149-159. Willment, J. A., A. S. Marshall, D. M. Reid, D. L. Williams, S. Y. Wong, S. Gordon, G. D. Brown. 2005. The human β-glucan receptor is widely expressed and functionally equivalent to murine Dectin-1 on primary cells. Eur. J. Immunol. 35: 1539-1547. Relloso, M., A. Puig-Kroger, O. M. Pello, J. L. Rodriguez-Fernandez, G. de la Rosa, N. Longo, J. Navarro, M. A. Munoz-Fernandez, P. Sanchez-Mateos, A. L. Corbi. 2002. DC-SIGN (CD209) expression is IL-4 dependent and is negatively regulated by IFN, TGF-β, and anti-inflammatory agents. J. Immunol. 168: 2634-2643. Kanazawa, N., K. Tashiro, Y. Miyachi. 2004. Signaling and immune regulatory role of the dendritic cell immunoreceptor (DCIR) family lectins: DCIR, DCAR, dectin-2 and BDCA-2. Immunobiology 209: 179-190. Kato, M., S. Khan, N. Gonzalez, B. P. O’Neill, K. J. McDonald, B. J. Cooper, N. Z. Angel, D. N. Hart. 2003. Hodgkin’s lymphoma cell lines express a fusion protein encoded by intergenically spliced mRNA for the multilectin receptor DEC-205 (CD205) and a novel C-type lectin receptor DCL-1. J. Biol. Chem. 278: 34035-34041. Gratchev, A., P. Guillot, N. Hakiy, O. Politz, C. E. Orfanos, K. Schledzewski, S. Goerdt. 2001. Alternatively activated macrophages differentially express fibronectin and its splice variants and the extracellular matrix protein βIG-H3. Scand. J. Immunol. 53: 386-392. Blackwell, J. M., S. Searle, H. Mohamed, J. K. White. 2003. Divalent cation transport and susceptibility to infectious and autoimmune disease: continuation of the Ity/Lsh/Bcg/Nramp1/Slc11a1 gene story. Immunol. Lett. 85: 197-203. Raes, G., R. Van den Bergh, P. De Baetselier, G. H. Ghassabeh, C. Scotton, M. Locati, A. Mantovani, S. Sozzani. 2005. Arginase-1 and Ym1 are markers for murine, but not human, alternatively activated myeloid cells. J. Immunol. 174: 6561 author reply 6561–6562.